UK Market leaders in Mobile Surveying Solutions Mobile CAD Surveying Ltd says that customer enquiry numbers have increased in their Award Winning Sitemaster Building software over the last few months. More enquiries are coming through than at anytime for the last couple of years and Surveyors and Architects make up the bulk of this new stream of business, this must be good news for the Construction Industry, because if Architects are asking for ways to speed up their survey processes then it must mean business is steadily increasing for them also. Mobile CAD Surveying Ltd also mention that their surveying arm Measured Building Surveys.net has also noticed a significant increase in enquiries coming through over the last couple of months too and they have won a number of good quality contracts. A spokesman said lets hope this is a sign that the future of the Construction Industry is starting to look up and turn around slowly, if Architects and Surveyors are seeing an upturn in work then Construction Company workloads will eventually follow suit. Surveys are conducted using a hand-held Laser Measure (Leica Disto D3aBT, Leica Disto D8 or a Hilti PD38) coupled via ‘Bluetooth’ technology to a hand-held microcomputer, many options for mobile micro computers or tablet pc’s are now available on the market. This approach, which produces the .DWG / .DXF and CAD (AutoCAD) drawing during the survey process, allows us to establish and accurately check all building dimensions while on site. Significant improvements in survey quality are gained using this equipment when compared with traditional survey methods. Check measurements are taken to ensure accuracy Gone are the days where two men would hold a sagging tape measure from one end of the room to the other, that old method is history! There are NO more return visits to site due to blunt pencils and inaccurate paper documentation, NO guesswork, NO wrong data documentation NO sagging tape measures. For more information on their Sitemaster Building software, visit the website and try out for FREE the software. The UK Market leaders in Mobile Surveying Solutions Mobile CAD Surveying Ltd says there has been much better enquiry numbers in their Award Winning Sitemaster Building software since the beginning of the new year.. More enquiries are coming through than at anytime for the last couple of years and Surveyors and Architects make up the bulk of this new stream of business, this must be good news for the Construction Industry, because of Architects are asking for ways to speed up their survey processes then it must mean business is getting better. Mobile CAD Surveying Ltd also mention that their surveying arm Measured Building Surveys.net has also noticed an increase in enquiries coming through over the last coupe of months too. A spokesman said lets hope this is a sign that the future of the Construction Industry is starting to look up and turn around slowly,if Architects and Surveyors are seeing an upturn in work then Construction Company workloads will eventually follow suit. This approach, which produces the .DWG and CAD (AutoCAD) drawing during the survey process, allows us to establish and accurately check all building dimensions while on site. Significant improvements in survey quality are gained using this equipment when compared with traditional survey methods. For more information on Sitemaster Building software, visit their website for more information and to try out for FREE the software. Professionally equipped while working in the field – complete boxed solutions, now you can Hire the award winning mobile surveying solution kit with the Sitemaster software for your measured building surveys. 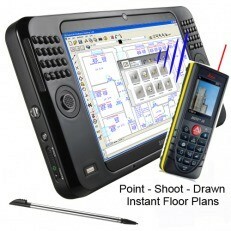 Save up to 70% of the time it takes to produce ‘As Built’ floor plans. Save money by hiring a Sitemaster bundle. Now you can hire the best Mobile Surveying Solution on the market. Recently made available by Mobile CAD Surveying, the Sitemaster Bundle is now available to hire. A GRAEBERT SPECIAL – FREE Sitemaster Building LT Licences! Buy SiteMaster Building FULL version and get one copy of SiteMaster Building LT for FREE (for a second machine) the cost of this should be £1,290.00net but they are offering it for only £995.00 for the period between 1/12/11 and 24/12/11 – so for every FULL Licence you buy, you get an LT Licence for FREE! Training available on all software. A brand new holster for the Viliv X70 tablet UMPC, allows the user to work hands free, comes with two pairs of straps and full instructions of how to use it. Access is possible to all ports, slots and buttons whilst the tablet pc is enclosed, saves taking the tablet out of the hoster to use it. We have been asked many times for videos and tutorials on the Award winning Sitemaster Building software, so recently we decided to do something about it. We have now created the first eight tutorials and will add more as our customers reequest them. We have been asked many times for videos and tutorials on the Award winning Sitemaster Building software, so recently we decided to do something about it. We have now created the first eight tutorials and will add more as our customers request them. Energy Performance Certificates (EPC) were introduced to help improve the energy efficiency of buildings. Accredited energy assessors produce EPCs alongside an associated report which suggests improvements to make a building more energy efficient. Now EPC Surveyors have a fantastic new tool at their disposal to help speed up the whole process. Sitemaster EPC is a leap forward in the commercial EPC process, developed by the German software manufacturer Graeberts who are responsible for the unique and award winning Sitemaster Building mobile CAD surveying solution. Sitemaster EPC software is a leap forward in the commercial EPC process, developed by the German software manufacturer Graeberts who are responsible for the unique and award winning Sitemaster Building mobile CAD surveying solution. Sitemaster EPC must be considered by all non- domestic energy assessors who wish to stay competitive in their field. Assessors use a tablet PC and a blue tooth enabled laser measure (supplied on purchase) to plot the building directly into the software. Minimal equipment helps ease of surveying with no need for paper and pencil, data is stored easily, can be adapted easily and forwarded on to be audited easily. Mobile CAD Surveying was instrumental in the development of Sitemaster EPC, we can offer further details on the system, your further equipment specifications and the financial options available to obtain Sitemaster EPC. We also provide training to the use the system which is a must to gain optimal performance. We know first hand the labour intensive process of producing a NDEPC and felt an easier approach was needed to make us more profitable, so we helped develop Sitemaster EPC. Sitemaster Building v5.0 Launched with additional features. Last week Mobile CAD Surveying announced the release of Sitemaster Building v5.0 with additional features. Sitemaster is their award winning mobile surveying solution software from the well known Graebert stable. For those already familiar with Sitemaster Building, you will be aware that producing the CAD drawings ‘on site’ in ‘real time’Â is the future of surveying and Measured Building Surveying,Â in fact, isnâ€™t it amazing to think that just five or six years ago virtually all surveyors took pencil and pad, tape measure or possibly a laser measuring device out into the field and spent several hours measuring up sites, buildings and all related detail before returning to the office to redraw the detail into their CAD package. * New Room Depth optionâ€¦.When creating door openings, you can not only measure the lengths of the wall right-hand and left-hand to the opening in the next room but also in one operation the depth of the room. Thus, the shape of a rectangular room can be generated immediately in the drawing. This will vastly speed up production of lower tolerance drawingsâ€¦EPC for instance. * New Building Services Libraryâ€¦.The Symbols area of the program now additionally provides a Library for Building Services which allows you to insert blocks for electrical power supplies, water supplies, and equipment such as boilers or extractors, into your floor plans. * New Dimensioned Symbols commandâ€¦ the Symbols area lets you now add a dimension line with a Symbol on it. You can quickly add to your site measurement plans, measured from one end point of a wall in the classic SiteMaster style. This feature is intended to be used especially to collect building services information (for example for kitchen planning), but basically can be used with any other symbol of the built-in or customized symbol library. * Door and Windows can now be placed into any wall. These can be openings which cover the entire length of a wall (in fact replacing the wall), or openings which have zero distance at one end of a wall. * The WIDTH attribute of door and window openings with retainer always gets the smallest (clear) distance of the opening. Why not download a FREE trial version now and see for yourself the future of mobile surveying solutions. Mobile CAD Surveying Ltd the main and preferred Graebert dealer in the UK, supplying mobile surveying solutions Worldwide. Using the ARES Core Engine for AutoCAD Compatibility. To express an interest or to be kept up to date with developments use their contact form. It was a high counsel that I once heard given to a young person, "Always do what you are afraid to do."